Game pieces in 6 colors are placed on the gameboard, always well mixed and never with two of the same color next to one another. These pieces are either marbles or wooden cylinders - your choice. Paletto is a varicolored logic game with only a few rules and therefore easy to learn. Who will have all playing pieces of one color in the end or take the last piece from the board? This is the object of the game. 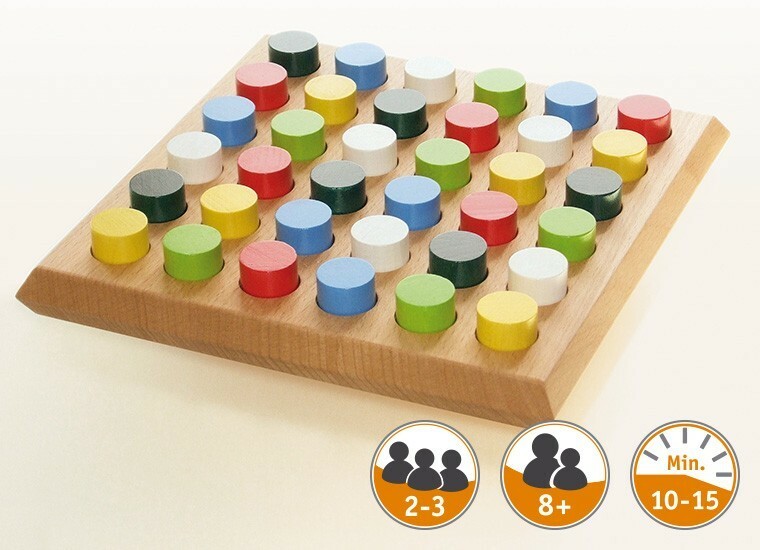 On each turn, you may take pieces of the same color off the board - but only if they are freely accessible from any two sides and all other playing pieces stay connected horizontally or vertically. In the beginning of the game, this applies only to the corner pieces, but after just a few turns, there are more and more possibilities. And when, at the latest, one of the players has 5 of the 6 pieces of one color, tactics comes into play. So the final third of the game becomes the most suspenseful: How can I prompt the other player(s) to take few pieces? Or to take a piece of a particular color? Warning! Not suitable for children under 36 months. Choking hazard!